Differentiating online scams from real threats is easier said than done. That’s because cybercriminals are getting increasingly proficient in imitating genuine browser alerts, as is the case with the Bankworm virus scam. The goal is always the same: to make it look like the Mac is malware-stricken in order to dupe the victim into downloading something actually malicious. It’s in every Apple Mac user’s best interest to keep viruses away from their machine and make sure its performance is at a consistently decent level. Acknowledging this mindset, threat actors out there are coining fraudulent campaigns whose objective is to manipulate the natural desire of security. In order to achieve a stronger intimidation effect, the fraudsters add some scary malware names to the mix. This is what’s happening in the Bankworm phony warning scenario. This particular con has been up and running since about 2015, yet it’s still afloat now in 2019. Its logic involves deceptive alerts that pop up in the web browser and give the victim a heads-up on the severe Bankworm virus, which isn’t on the Mac for real. This way, the malefactors try to upsell a rogue system utility called MacKeeper or Advanced Mac Cleaner. The rogue app’s name might vary, depending on the latest spinoff of this scareware lineage. The Bankworm popup scam is composed of several elements that the infected Mac user will encounter when routinely surfing the web. First off, it’s a dialog box that says “Virus found. The last website you visited has infected your Mac with a virus. Press OK to begin the repair process”. Although this alert contains a clickable OK button, hitting it will only pave the way for subsequent spoof warnings. Another one contains a similar alert but additionally includes actual information about the plagued device, such as the version of macOS or Mac OS X, the browser build, IP address, ISP name, and the location. These details are retrieved by means of basic reconnaissance that the browser hijacker conducts in the host machine prior to the malvertising outbreak. Obviously, seeing this sensitive data instills a bit more trust and encourages the victim to follow the further recommendations. The wording of the alert in the header of this splash screen is as follows: “A website you have visited today has infected your Mac with a virus. A full system scan is now required to find and remove harmful files or applications from your OS X device”. Finally, the scam is complemented with the key component that raises a red flag on the mysterious Bankworm. This popup warning emphasizes that it’s a high risk virus, and the infected file’s path is “/os/apps/worm.icv”. The virus removal section of the same screen recommends an application to sort out the purported security quandary. Again, it can be MacKeeper, Advanced Mac Cleaner, or some other phony program from the same family. The price tag is labeled “Free”, which is only true until the victim actually runs the imposed scan. The report is going to list the Bankworm malware along with a bunch of other inexistent threats, just to pressure the user into removing the culprits. That’s when the rogue app shows its fangs by saying that the fix is only possible on a payment basis. This is something one might expect from counterfeit AV and optimization tools like that, which are made to bring profit rather than deliver free services. All in all, the Bankworm alerts are isolated to the contaminated web browser and report an imaginary virus rather than something the user should worry about. Therefore, installing a piece of software to get rid of the fake menace doesn’t make sense. The only worthwhile action is to eradicate the browser malware that displays those fishy popup alerts in the first place. 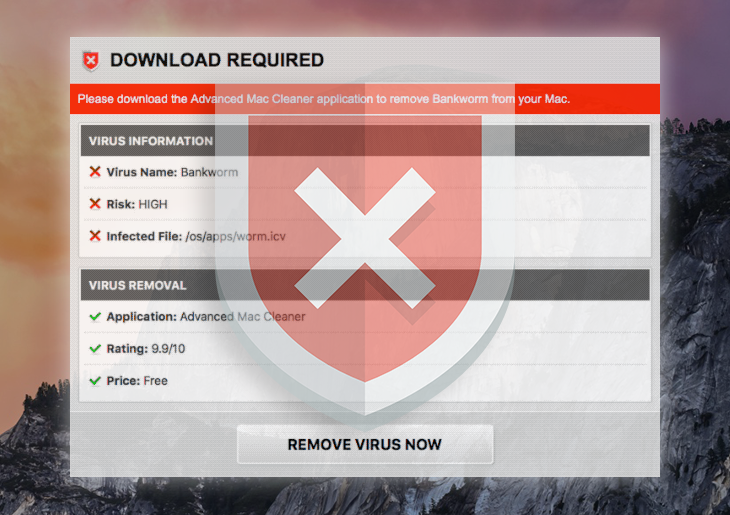 When confronted with malicious code like the Bankworm alerts on Mac, you can neutralize the toxic impact by leveraging a specially crafted system utility. The Freshmac application (read review) is a perfect match for this purpose as it delivers essential security features along with must-have modules for Mac optimization. This tool cleans unneeded applications and persistent malware in one click. It also protects your privacy by eliminating tracking cookies, frees up disk space, and manages startup apps to decrease boot time. On top of that, it boasts 24/7 tech support. The following steps will walk you through automatic removal of the Bankworm popup infection. Check whether the Bankworm virus alerts issue has been fixed. If it perseveres, go to the Uninstaller option on Freshmac GUI. Locate an entry that appears suspicious, select it and click Fix Safely button to force-uninstall the unwanted application. Go to Temp and Startup Apps panes on the interface and have all redundant or suspicious items eliminated as well. The Bankworm virus fraud shouldn’t be causing any further trouble.